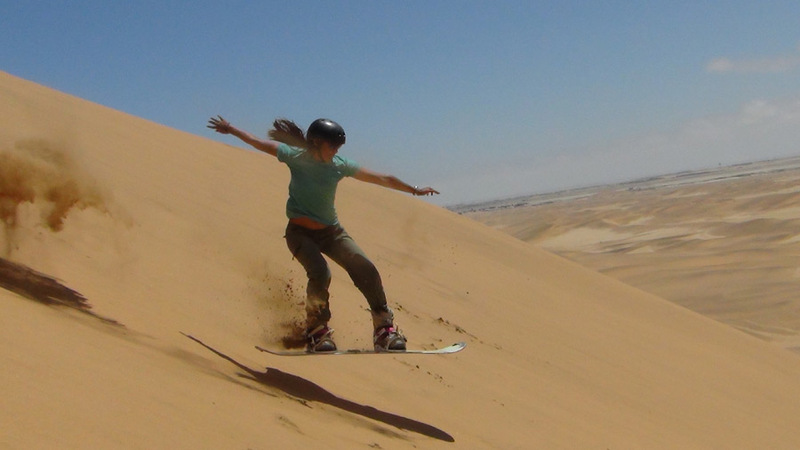 One of the main reasons that we chose the Oasis Overland Coast to Coast trip was because the tour stops in Namibia, and we knew we would be able to try sandboarding there. 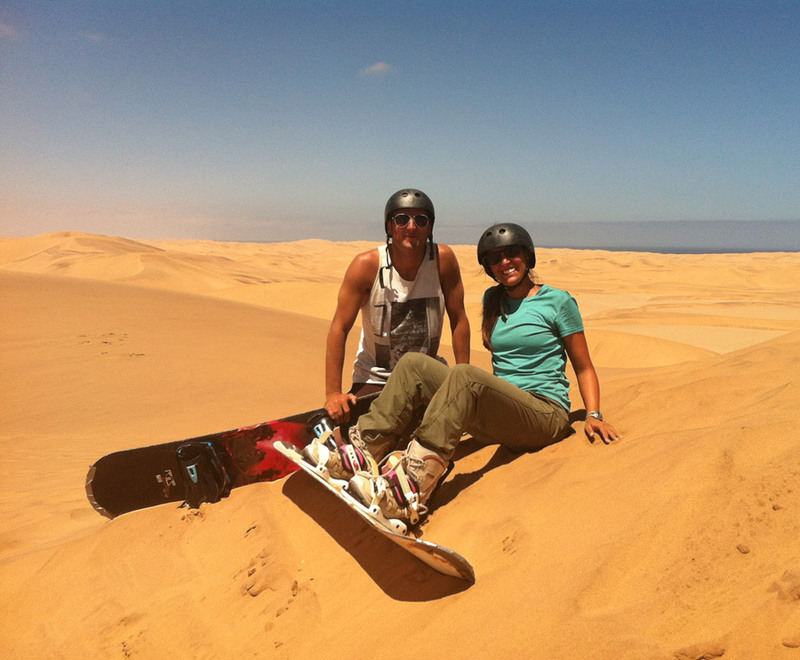 I mean, the Namibian landscape and Namib desert walks were up there too, but as snowboarders who are not crazy about cold weather, this sounded perfect for us. 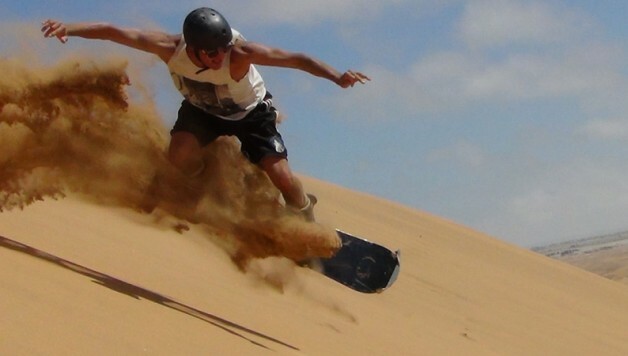 This morning we head out to the dune with our guides/instructors from Alter Action Sandboarding, get our boards and boots, and start climbing the sand “mountain”. 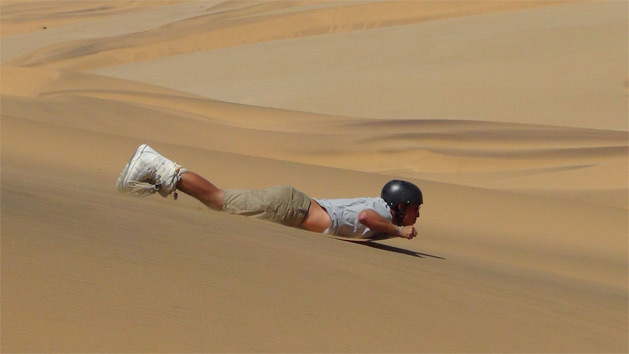 Lifts or tow ropes aren’t possible, not just because sand makes for a terrible fountain, but the peak of the dune is always shifting, sometimes overnight. 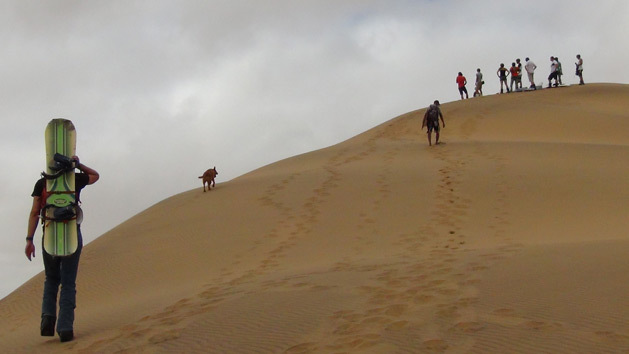 The walk is slow, and we’re all pretty winded by the time we get to the top. 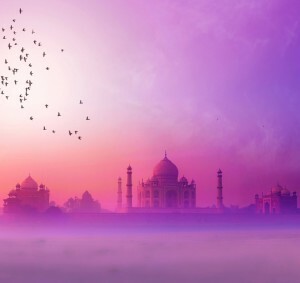 We admire the views while we catch our breath and get some instructions. Soon those of us with boarding experience hit the slope. 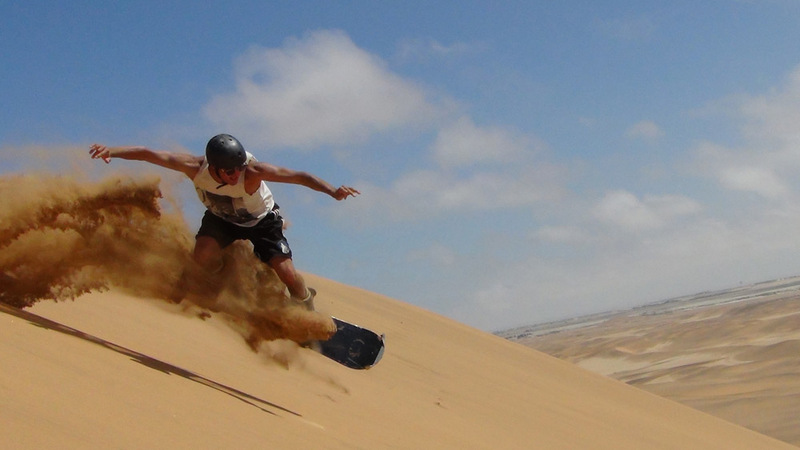 We had an awesome day on the dune, and an added bonus comes a few hours later when the photographer of the day sets up a viewing gives us all a free DVD. 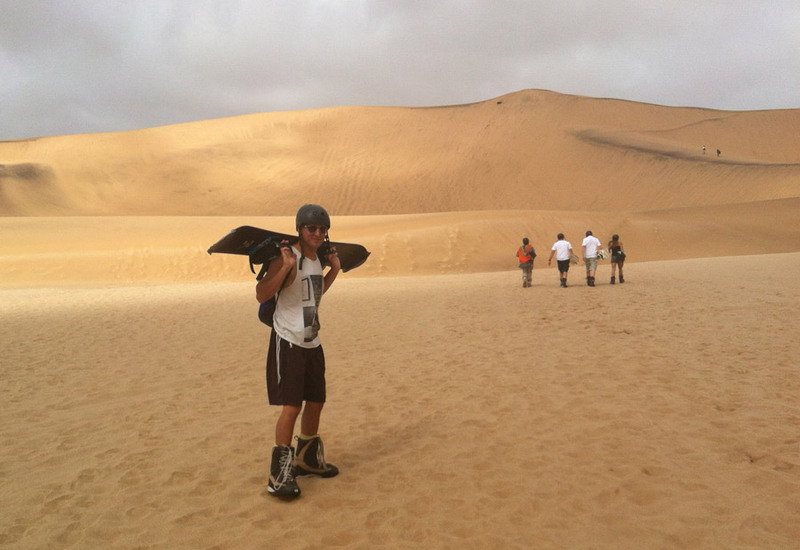 Dan will make sure to include some of the clips in our Africa highlight video later this month. 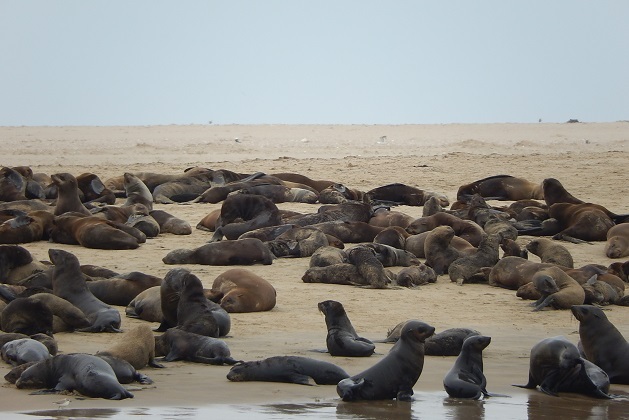 I also signed up for another popular activity in the town of Swakopmund: a boat cruise with seal and dolphin watching. About 20 of us board the boat in the morning at the nearby town of Walvis Bay. We meet our captain (who’s name I miss) and it’s clear he knows his stuff. 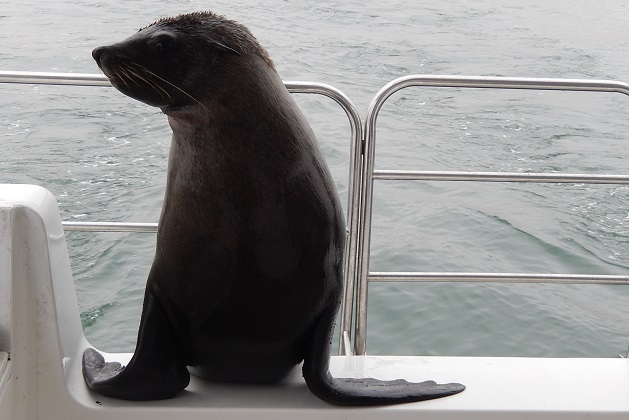 He starts telling us about the bay and some of the animals we will hopefully see, when a seal jumps on board. Really. Within only five minutes of leaving the dock. Turns out, his name is Splash, and he is a regular on this boat. 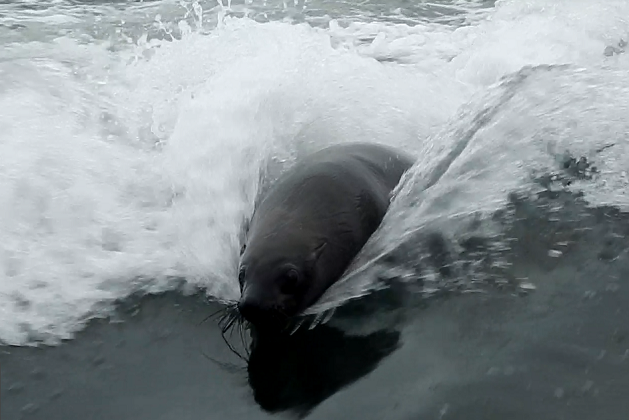 The captain has trained a few seals to eat dead fish (which most seals won’t do) and perform a few tricks for passengers, such as a big splash on cue and surfing in the wake of the boat. After Splash departed, we soon had another visitor. 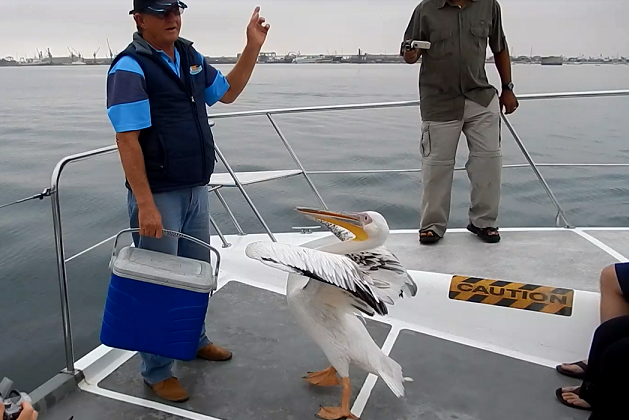 A great white pelican, who was also buddies with our captain, but intent on pecking everyone else. Definitely not my favorite part of the boat trip! The rest of the relaxing cruise was spent spotting dolphins jumping (which are impossible to photograph, so I just left my camera off to enjoy the show). We also visited a huge sand spit called Pelican Point. We learned a sand spit is when a sand bar creates a natural bay. Most of the sand is crowded with seals, jumping, playing, barking, and just generally entertaining boats like ours slowing cruising past. We finished the day in style with oysters and champagne, then said goodbye to Splash the seal as he jumped onto the boat on our way back to the dock. 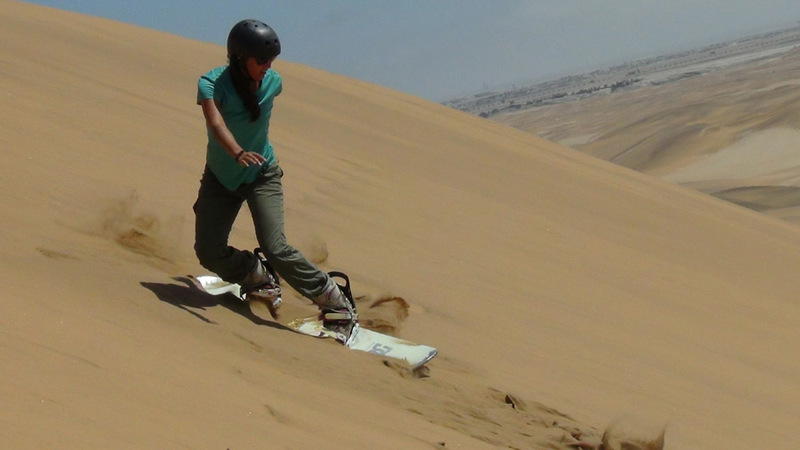 The cruise ends up beating my expectations, and is something I recommend when visiting Swakopmund.